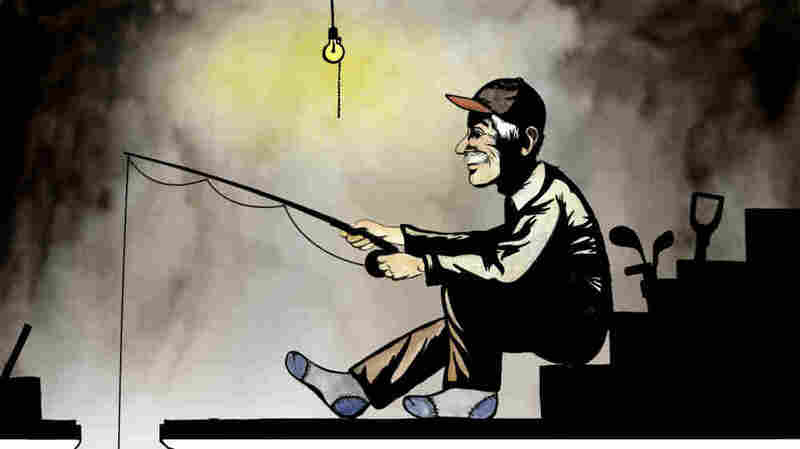 Fishing In The Basement: A Manhattan Tale : Krulwich Wonders... On the corner of 53rd and Second Avenue, in the summer of 1955, a store owner grabbed his fishing pole ... and headed downstairs. His goal? To fish the dark waters of a subterranean stream. I keep thinking about this story. It's so unlikely, so unreasonable, but I can't stop wondering ... could this be? The time is 1955. We're in a building, 992 Second Avenue in Manhattan to be exact, on 53rd Street. The teller of this tale is Jack Gasnick, the owner and operator of a hardware store on the first floor — Gasnick Supply. There was such a store, we've checked. There was a Jack Gasnick, we checked that too. And the store had a basement. In a letter to The New York Times published on Aug. 22, 1971, Mr. Gasnick describes how in the summer of '55, there'd been a hurricane, Hurricane Diane, and a stream, he says, that flowed under his Second Avenue building had swollen and flooded the basement. To his surprise, he wrote, "When the flood receded, there was left in its wake two or three flapping fish." ... fifteen feet below I clearly saw the stream bubbling and pushing about, five feet wide and upon its either side, dark green-mossed rocks. ... With plumb-bob and line, I cast in and found the stream to be over six feet deep. The spray splashed upwards from time to time and standing on the basement floor, I felt its tingling coolness. Feeling a tug, I hauled up in excitement and there was a carp skipping before me, an almost three-pounder. I was brave enough to have it pan-broiled and buttered in our upstairs kitchen and shared it with my brother. Could this be? Could there be three-pound carp living in streams hidden underneath Manhattan buildings, or is this the fishy equivalent of the fantasy alligators that always lurk but never emerge from the sewers of New York? Well, The New York Times tried to update this story in 2007. A reader remembered Gasnick's letter and (assuming it was true) asked, "Do people still fish under Manhattan?" The Times Metro Desk asked a reporter, Andy Newman of the Brooklyn bureau, to look around and he found no current evidence of underwater fisheries. What's more, he talked to a scientist who said the whole tale seems a little unlikely. Fat basement carp? For one thing, what would they eat? They need a food source, and away from sun, photosynthesis and plant life, they'd probably starve, not grow. It's possible, he thought, that "someone dumped them into this underground rivulet" shortly before they reached Mr. Gasnick's basement, or maybe they migrated down from some surface pond hidden in someone's backyard. But there are no underground streams in the neighborhood today, and no new fishermen have turned up saying "me too, my basement has 'em." Don't bother to look for the building [wrote Anonymous], it's gone — demolished about seven years ago to build overpriced high-rise condos. Not only is the building gone, the store's gone, Jack Gasnick's gone, the stream, if it ever existed, has gone too. Who knows if his story was true? Jack, some say, liked to embroider. I was able to find basement fishing stories from other cities that are newer and seem to check out, but in Manhattan, all the trails have gone dry. But how much would I love to find myself in New York City for a weekend, perhaps sent there by work to cover a story — when the phone rings in my hotel room. It's 11pm. I'm tired, but I answer. An old man is on the other end, and he clears his throat and he says: "I think this is something you'd like to see." I doubt, I delay, I debate with myself — but I soon take a cab, and, as the clock strikes 12am, I'm led down into the basement of a red brick tenement building on E. 13th Street. 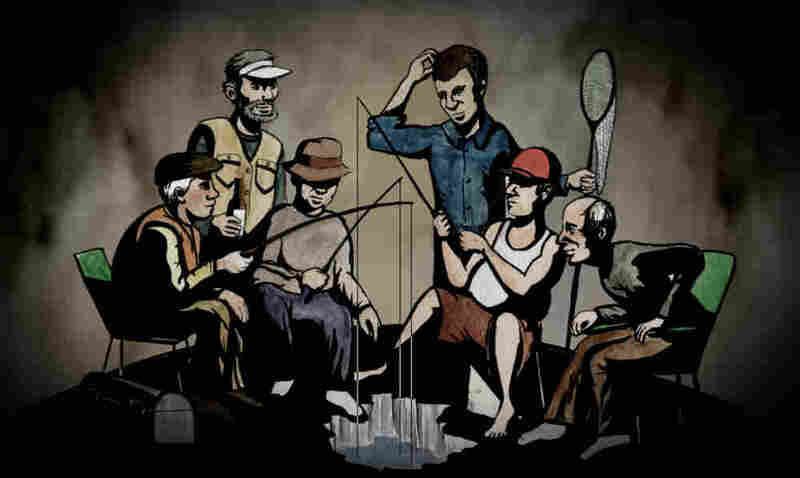 I step into a large room that smells vaguely of water – and six men are sitting around an opening in the floor, holding fishing poles in the darkness. You can almost see them down there, can't you?